Ask fellow campers about "Flamingo Campground (NPS Campground)" and nearby attractions. We stayed at the park for three days. Seemed overpriced for what we got. Nice new power pedal poles at each site. Paved pull through with large lot size. Poor grass not well kept. Dump stations were not well done, no control of drainage, should have dedicated rinse water for tank rinse and not use same water connection for fresh water they could have teed off with a backflow preventer very inexpensively. Over the camp ground seems to be suffering from minimal maintenance, I understand hurricanes damage I live here in Florida full time, I expect more from our national park service. Some staff members at the main entrance need customer service training. Overlooks were over grown minor pruning would allow better view and access. Ever hear of Eagle Scout Projects. Glad I went, not sure will be on my top of list to do again. We camped at Flamingo Campground (NPS Campground) in a Motorhome. We stayed for 2 weeks, and when we arrived the weeds were over my ankles, so guess how high they were in 2 weeks? The problem with not mowing is the snakes, bugs and critters. We had an end spot, so it was huge but you didn't want to walk out because of the snakes. You don't see them in the tall weeds until you are on them. Because there are inner rows with electric, the other rows surrounding you do not have power, and many run generators from 8 am to 10 pm, non stop. I bet they are very hot, but it's a hum of noise all day. Come late afternoon with out wind, head to the camper or you are eaten alive. We knew this going in, but you may not. No water at your site, but one bathroom had a fill and a dump. There was no designated rinse for dump, so everyone was using the fresh water fill. To be clear, the campground has no hot water for showers or dish washing station. Check out is 10 am, pretty early. Positives: great biking, birding, att to stream movies. Make sure to go on a late afternoon boat ride. We camped at Flamingo Campground (NPS Campground) in a Motorhome. Ask for an end site. Don't get the site by the dump station as people line up to dump all day. 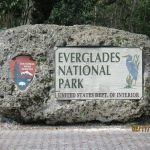 We loved our stay at Flamingo Campground in the Everglades National Park. This campground would have gotten a 10 if they had water at the campsites, but they did have fresh water filling stations to fill your fresh water tanks. The sites are pull thru and level! The T Loop has electric hook up. The cell signal is excellent if you have ATT! If you have Verizon, you are out of luck. We arrived after hours and had no problem checking in. We drove past the entrance, and drove the 40 miles into the park to the campground. We found our name on the white board located in the rangers station's window. Our name was on the board with our site number. There is a general store located at the marina, not far from the campground and they have the basic supplies you might have forgotten to get. We are already planning our return visit for next year! We camped at Flamingo Campground (NPS Campground) in a Fifth Wheel. We loved the 2 boat tours that were offered at the marina. We did the back country boat tour in the morning and then did the sunset boat tour in the Florida Bay! Our cat was bitten by a pygmy rattlesnake in T loop camp ground. He was walking on a leash near a tree. The camp site was in the middle of a campground area. Luckily he was not injected with venom. Ended up at Miami Vet specialists in Miami for treatment. Watch your dogs! I heard twp dogs were bitten in the past by the same snake species. Bring your weed whackers and ant killer! Dump station and water fill adjacent to bathhouse. Choose your site carefully as you don’t want to be next to that. Nice new power posts. We camped at Flamingo Campground (NPS Campground) in a Motorhome. Campground host was very nasty. Bad attitude towards campers and thought him and our neighbor man were going to get into a physical altercation. The problem is there is never anyone at the gatehouse. If you don't go to the campground host site, then there is no way to know what site you're in. When you go to the host site, there is no one there either. So we continued to drive circles around the park and then finally pulled into a empty site. An hour later he is pounding our door down telling us to move and move now. Said we weren't on the list. Come to find out, the list is two days behind due to previous hurricane Irma issues. So we moved to overflow and ran off the generator. Meanwhile the electric sites sat empty. He patrols like he's a control freak and needs to be doing his job welcoming campers instead of grouching. Other than the nasty host though, this place is an incredible experience and beautiful to see and explore. We loved it there. Spaces are huge and plenty of room and many have shade. Beach is a nice place to play and photo opportunities are plentiful. Wildlife is amazing. Take plenty of mosquito spray, water and fuel and expect no cell coverage out there. Progress is being made on cleaning up the other 2 campgrounds there. We seen bulldozers and trucks and men working everyday we were there. It's coming along great. Plenty of trails to walk and explore and the Visitor center has rangers that are nice and will answer all your questions etc. They have a nice display center about the park and park maps available also. Love the Everglades. Would go back to Flamingo Campground. We camped at Flamingo Campground (NPS Campground) in a Motorhome. Fuel your tow vehicle in town so you can explore the entire park from the camp. This CG is about 50 miles from the closest resupply so come in with all your supplies, empty waste tanks and full fresh water. Dump station and fresh water is available however when we were there they were having a lot of problems with their water system and you had to boil your consumable water. I suspect that this is going to be a continuing issue due to the lack of funding the National Park Service receives. Sites are all pull through paved with picnic table and fire ring. The reservable sites (41) are all power with 20/30/50 amp. The park was still cleaning up after Irma and has taken a beating over the years from a number of hurricanes. The power sites were running a 10-15% vacancy every night and the host refused to let anyone use them unless they had a reservation. There is no wifi, no Verizon reception but I heard AT&T had a weak signal. You had to drive at least 11 miles to get phone and I had to drive out 20+ miles to get internet. The only services they have down there are canoe and kayak rentals and fuel for boats. We didn't have any problems with bugs but it was windy and coolish the whole time we were there. The "T" loop is the only one open right now and all the non electric sites are first come. We had to extend another day and had to move to one of these despite the fact that there were 6 open electrical sites. One should note that this concessionaire does not require that anybody stay in the sites if you have paid for the site and you can apparently just park you boat trailer in a site and leave it. This pretty much goes against every regulation I have seen in every Federal campground I've been to. The NP site still mentions a hotel and store but they were torn down due to hurricane damage. The one convenient store was closed due to flooding and showed no signs of being reopened. We'd stay here again if we wanted to visit the Everglades. We camped at Flamingo Campground (NPS Campground) in a Motorhome. Hurricane Irma left her mark on the Park. There are large slash piles of dead trees scattered around. The once abundant bird populations seem to have moved out of there area. 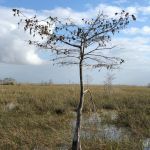 There are large swaths of dead trees probably due to the storm surge. It will be interesting to come back in a few years to see how it regenerates. Fishing and paddling opportunities are abundant and I pretty sure the birds will be back for the bird watching. This is a very spacious campground with three loops, of which one has electric (reservations are recommended for electric sites). Solar showers here were great, with very hot water, with one downside: they are located in the primitive camping loop. The mosquitoes here pretty much ruined the camping...I've never seen mosquitoes in such numbers in my life. Every time we opened the door or walked to the restrooms it was a battle. However, the national park is well worth it, just bring netted clothing, hats, and repellent. We camped at Flamingo Campground (NPS Campground) in a Motorhome. I will always remember this campground at the southern tip of the Everglades as full of mosquitos and black vultures. Mosquitos are so bad that unless you have a screen house you will not be sitting outside. Lots of bug spray and be prepared mosquitos will get in your camper. Vultures will potentially land on your car/camper and have been known to eat the rubber. They also don't seem to be afraid of dogs at all - amazing!. Campground had water and electric hookup. Easy walk to the water, but would be a little bit of a walking hike to Flamingo marina. Never saw the campground host. We reserved online and chose our own site when we got there. We camped at Flamingo Campground (NPS Campground) in a Motorhome. No water & sewer hookup in RV section. Electricity only. Water fill at all restrooms. Only restroom without hot water is in the most expensive part of campground. (RV electric sites). Hot water is solar heated - so plan to have a hot shower mid-morning to dusk. Spacious sites Not all have fire rings Great staff - every one that worked there was super friendly & knowledgable. There are so many mosquitos that you won't do any outdoor living. You have to stay moving to avoid getting eaten alive. Especially when bird watching. The Flamingo visitors center could use a lot of TLC - this is one of the largest National Parks - it should be at least mowed more & landscaped. We camped at Flamingo Campground (NPS Campground) in a Travel Trailer. No Water hook up BUY gallon jugs of water to drink - the water there is tea colored. 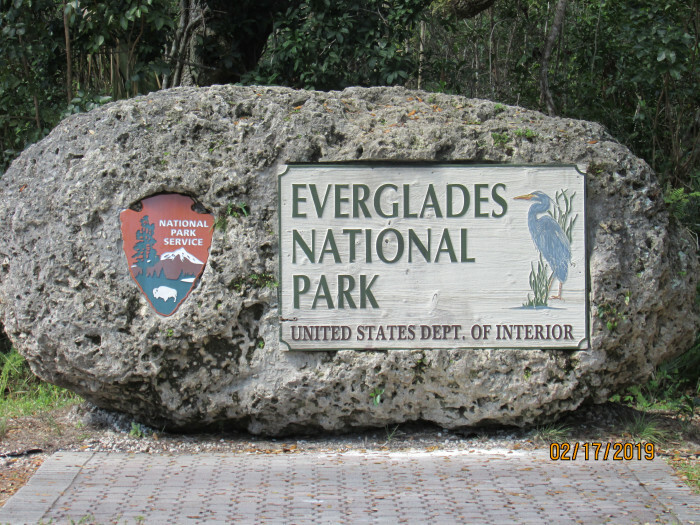 Flamingo campground in the Everglades National Park is spacious with lots of room between each site. Most the sites are large enough to contain both the motorhome and a towed vehicle with room to spare. There's 50/30 amp at the RV sites with water and sewer at the restrooms. Within a mile is a small marina that offers small watercraft rentals and tours on large boats ($35.00/person). The view from the campground looks out over the Keys and there's usually a nice breeze. What's the downside? Mosquitos! The Mosquitos were so thick in December when we visited that we ended up leaving a day early. They were fairly well contained with Deet but sitting outside was impossible--if fact, just opening the RV door let hundreds of them in. Verizon service at the campground is non-existent and OTA TV reception was spotty. Overall, we liked the park but just couldn't deal with the mosquitos. We camped at Flamingo Campground (NPS Campground) in a Motorhome. Hike the trails. Most are less than a mile long and each is unique in features and terrain. Also, visit the decommissioned Nike site. There's a tour every weekend day at 2:00 but there's self-paced tours the rest of the time which are supplemented by a very knowledgeable volunteer at the restored igloo. We were so excited when we pulled into the campground. We had the entire campground to ourselves! And when we opened our truck doors, we found out why--NP Welcome Committee consisting of 10 million mosquitoes. So I'd advise not camping here in September. Only a few sites had been mowed, so tall grass was everywhere. We only stayed two days because it was impossible to avoid the mosquito swarms. If you could find out the mosquito level and camp when the level is low, this would be a great campground. We camped at Flamingo Campground (NPS Campground) in a Fifth Wheel. Find out about the mosquito level before you go! We arrived on the last day when you need to have reservations, and then stayed for 4 more days. There were about 10 other campers when we were there, so the place really cleared out at the beginning of April. The T (for Trailer) loop has electricity at the sites. You can fill up with water at the bath houses, and there is a dump station. This is NPS, so it is no frills camping. You are at the end of a 38 mile road in the Everglades. Fill up with gas and do your grocery shopping before you come. 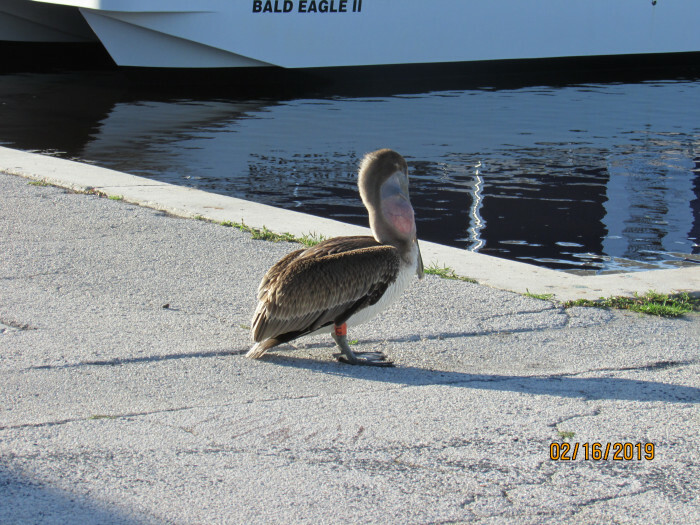 Flamingo is on the shores of beautiful Florida Bay. The Flamingo marina is just a mile or so away. Bring your bicycles, it helps to get around the Flamingo area. We kayaked in Florida Bay, and did a lot of bird and animal watching. The bugs were bad at dusk on the fringes of the campground near the trees. The campground ranger and camp host were very helpful and friendly. There are vultures everywhere in the Everglades. It was comical to see them sitting on the top of the bathhouse roof in the campground. We camped at Flamingo Campground (NPS Campground) in a Motorhome. Robert is Here is a quirky fruit/vege stand that you pass just before you enter the park. They have yummy tropical fruit milk shakes. We loaded up on fruit and vegies there as well. The Everglades are so amazing and varied. The turn offs from the road on the way in were really interesting and informative. The large campsites offer little privacy but have extremely easy access. A site with electricity probably requires a reservation. There is no water at the campsite, so we filled our tank upon arrival. We also brought drinking water with us as we'd heard the water was not great. The bugs weren't too bad, but we were out toward the center of the T loop where the ranger said the problems were less. One downside is no phone, no wifi, and no TV. We enjoyed the kayaking and fishing very much, plus all the great bird and animal viewing. We took the boat trip out into Florida Bay which was nice. We had done the backcountry trip a few years back. The store has a few basics, plus lots of souvenir times. A small restaurant offers pizza, burgers, fries, and even beer. This is one of the very best values for camping in this part of Florida, for sure! I expect this campground might see more business as 2 of the large RV parks in the Keys are closing this year, so campsites in South Florida will be at a premium during the winter season. It's not for everyone, however, as it is quite remote to shopping and services. We camped at Flamingo Campground (NPS Campground) in a Travel Trailer. Shop in Homestead before coming in! Fill up the gas tank. There are several loops. An Electric only site on T-Loop, just next to the bath house where there are 2 spigots and sinks for dish washing as well as a dump station. All sites in this loop are pull-through and seem quite level but a few Class C motor homes had some little adjustments made with a few level blocks. T-loop bath houses do not have any hot water. Water hook up is not at the site; however, there is a drinking water fill site available at each bath house together with a dump station. Due to record rainfall in January, contrary to the fact that January is one of the driest months here, there were some puddles of water in driveways; however, they seemed to be dried up by the third day. Average daytime temperature has been in the low 80s with a nice breeze. For a hot water shower, one needs to go to a bathhouse in the A, B, or C Loop. Hot water is provided by solar panels, and the temperature of the hot shower was more than adequate. (I do take a very hot shower.) However, I have heard one lady saying that there was not enough hot water on January 31, which was very cloudy and rainy. There is a picnic table and a fire pit at each site. At least a few buttonwood trees and Royal Palm trees stand between each site, which also provides a nice shady area. Unlike commercial RV campgrounds, there is at least 60-70 feet between each site. Satellite reception is quite good for DirecTV but we were not able to get any English speaking TV stations by antenna. For ATT, no LTE; but we were able to get constant 4G. There is a shop in the Flamingo area, which is about 1 mile from the RV sites and it is possible to walk there. Eco Pond, where you can see many types of birds is also nearby. The nightly rate is $30 for an electric site. With the Golden Pass, a 50% discount applies. There is a charge for park admission. Site T18 is just next to the bath house and is wheelchair accessible. We camped at Flamingo Campground (NPS Campground) in a Motorhome. Visitor Center at Flamingo has lots of information in the park. We stayed here in the T electric section for two weeks. Unfortunately, it was quite a cool month. The upside, however, was that there were only a few days where the mosquitos bothered us. Nice level sites with concrete pads. Lots of space between sites. Great hot showers heated by solar panels in the nearby tent sections. 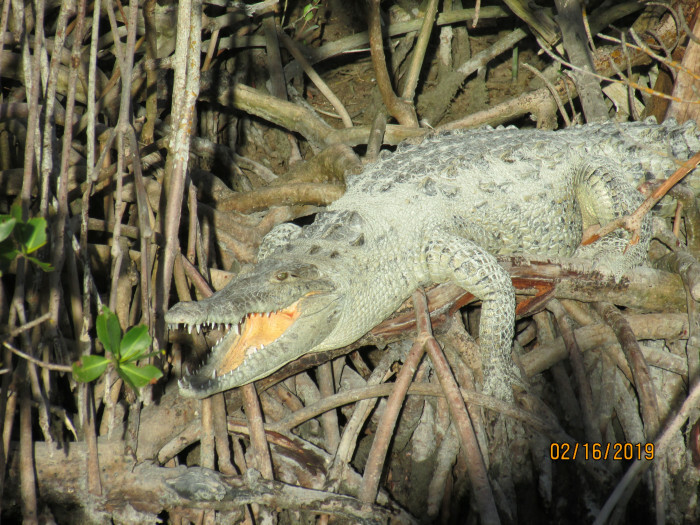 Lots of alligators, crocs and amazing birds! Do take the ranger walks and talks. We camped at Flamingo Campground (NPS Campground) in a Motorhome. Bring lots of sunscreen, insect repellent and books to read. If you enjoy riding your bike on good, level and not too busy roads, bring your bike and try the main park road. It's 42 miles long. Nearest full-grocery store is an hours drive away. Marina store for snacks. The cafe was open for lunch, and their food was good. We enjoyed the boat tours. 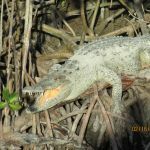 Experience the special nature in the Everglades. 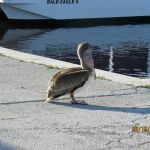 Ranger led bird and wild life viewing tours and boat tours in the back crountry as well as on Florida Bay. Boat tours are rather pricey ($35 pr. person for a 90 min. tour). Make sure to bring plenty mosquito repellant or you will stay inside your unit most of the times. Stock up your refrigerator and pantry in Homestead before driving out. If you don't have a reservation and the sign at the entrance kiosk says the campground is full, believe it. Don't make the 38 mile trip hoping to find an open site. This is a place for nature lovers. Far away from the next town. For many people there is no phone or Internet. Unless, you happen to have AT&T. Bring your bikes and or kayaks. This is an outdoors kind of place. Are you affiliated with Flamingo Campground (NPS Campground) ?